Because of the expected heavy rains and strong winds to be brought by Typhoon Labuyo, several local government units have already announced class suspensions for tomorrow, August 12. This post relies on the Twitter accounts of LGUs and media networks as information source (as of 9:00PM). Pau Gasol of the Los Angeles Lakers congratulated the national teams of Philippines, Iran, and South Korea for earning a slot in the 2014 World Basketball Championships in Spain. Gasol, who is expected to once again play for the Spanish national squad, sent his felicitations via microblogging site Twitter Sunday night (Manila time). Gasol excused himself from taking part in the FIBA EuroBasket this year because of a lingering injury. 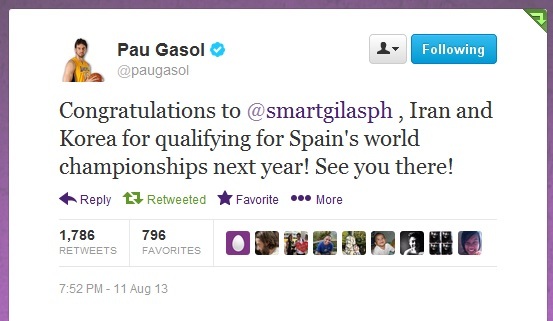 Philippines and Iran are still playing for the Asian championship when Gasol sent the tweet.